cardigans and kids: sugar cookie recipe. from Martha Stewart Everyday Cooking. Whisk dry ingredients in a medium sized bowl. Mix butter and sugar 2-4 minutes. Add egg and vanilla. Then alternate adding sour cream and dry mixture. Spoon (3 tablespoons) onto baking sheet. Bake 20-25 minutes. Rotate in oven half way through. If you are making the cookies "normal size" I bake for 15 minutes, still rotating half way through. They should just be starting to golden on the top when you take them out of the oven. 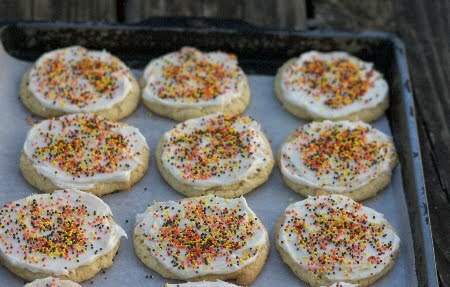 * Also, if you aren't going to frost the cookies, the recipe recommends sprinkling sugar over the tops. I usually make a cream cheese/powder sugar frosting. 1/2 stick unsalted butter, room temp. Thanks for visiting! Some info about myself: I'm grateful for Jesus Christ. I love my family, God's Word and people. Some of my favs: yoga, running, knitting, fresh flowers & fair-trade coffee.